Our latest guest post is by Gwynne Margaret Bruck, who is a fan of the site. She recently traveled to Madagascar to attend a Famadihana ceremony, but was unsuccessful. So, instead she came back with a stack of Malagasy singles. If you have any interesting records or cassettes that you wish to share from some of the countries that we have yet to hear from – say like Bangladesh, Central African Republic, Kazakhstan, Libya, Somalia or Tanzania – or countries that we need to hear more from – like Laos, Sudan or Syria – please get in touch. Inspired by the collections of this site and Sublime Frequencies I decided on my recent trip to Madagascar to do a little record hunting. A co-worker from Ghana had suggested I bring a record with me to show people in case I should run into any language barriers. I followed his advice and it worked far better than I expected. Outside my hotel in Antanarivo were people selling local crafts and one day I showed the valiha (Malagasy bamboo zither) salesman a 45 and asked if he knew where I could find a Malagasy version. He didn’t have any but he took me to the tin can toy car salesman who asked me to wait twenty minutes and he’d be right back. He literally ran down the street and the valiha salesman explained he had some records at home. Twenty minutes later he returned with a stack of about ten of the filthiest cracked and scratched 45s I’d ever seen. He told me they were all Malagasy but as I looked through them I found a few Boney M‘s. I told him I would buy the Malagsy stuff only and he tried to persuade me on the greatness of Boney M even though I told him I could get those back home. I bought all the local stuff for around $5 each although I suspected they would be impossible to play. The price seemed steep and I actually did talk him down a little but in the end I figured he needed the money more than me. For the next couple of days until I left Antanarivo I could not leave the hotel without men chasing me down to sell me their records. We would go behind this gate in a kind of a shady back alley sort of spot for the transactions as though it was drug deal. As I would shuffle through their records to sift out the Boney M’s they would look at the disc, sing a bit of the song it contained and show me the corresponding dance. In the end they threw in the Boney M’s for free and I ended up with around forty Malagasy 45s. The two main record labels I found were Discomad and Kaiamba. 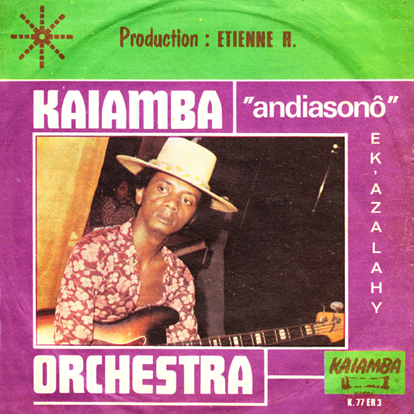 I could be wrong but I suspect the Kaiamba Orchestra might have been made up of various popular musicians on the label. I found some of the Orchestra members’ names on other records I had obtained, most notably Jean Kely. Here is a link to a video of a Jean Kely and Basth performance from 1999. 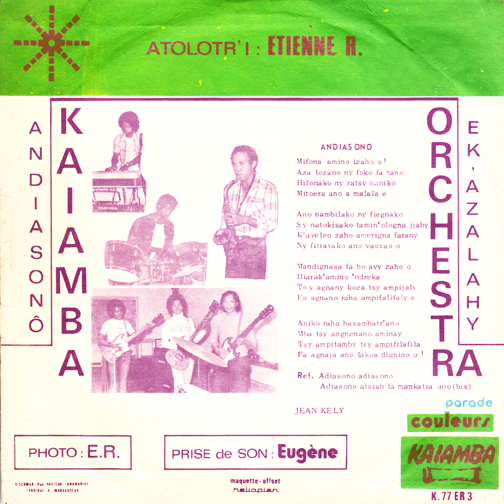 Catalog number K.77 ER 3 on Kaiamba Records of Madagascar. No release date listed. Although I have read that some people thought Les Safari may have been from Morocco, they were originally from Madagascar. They moved to France in an attempt to have the same success as fellow Malagasys Les Surfs (who were not a surf band). They released four records between 1965 and 1967. 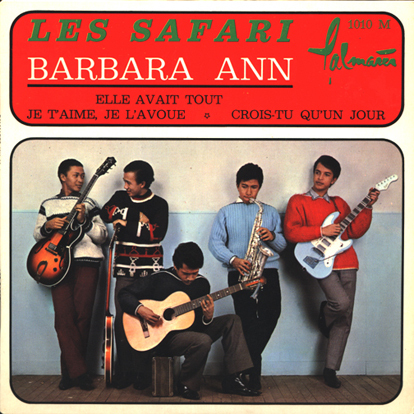 This record is the second of two singles that they recorded for the French Palmarés label. They would later record two singles for CBS. Before they changed their name to Les Safari, they were called C.C.C. Guitares. Thanks to Stéphane Leroux-Lemeuier at Encyclopédisque for the information. Catalog number 1010 M on Palmarés records of France, released in 1966. 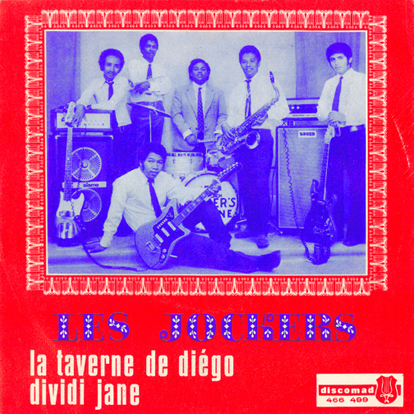 Les Jockers were from the island nation of Madagascar which is in the Indian Ocean, off the eastern coast of Africa. I have not been able to find anything about the band. If you have any information, please contact me. Catalog number 466 499 on Discomad records of Diégo-Suarez. No date listed, but the name of the city Diégo-Suarez was changed to Antsiranana in 1975… No other information is available.